Businesses create 50% of New Zealand’s total energy use, with 40% of CO2 emissions. The advantages for solar power in commercial enterprises are easy to see. Alongside the financial benefits, allowing reinvestment into other parts of the business as fuel bills are reduced, businesses can supplement their marketable reputation as innovative and forward thinking, as well as increasing their sustainability credentials. The Energy Efficiency & Conservation Authority’s (EECA) 2013/14 Annual Report has further backed the idea by placing commercial solar power into their key long term programmes, by helping businesses to identify new market opportunities based on renewable energy technologies. The ethical and environmental advantages of turning to renewable energy production are well documented, and many businesses have benefited from stronger local relationships and national reputations as a result. Ethical considerations, especially environmental consideration are an important part of both the local community and the local economy, and for many businesses leaders, creating a more sustainable, greener business is incentive enough, but any changes to image and brand values must always be considered in relation to the financial side. In the case of generating energy from a solar power system, the two can go hand in hand. Data from the EECA 2013/14 annual report estimate that businesses would be able to save on average 20% of their energy bills through a more considered energy use, but commercial solar power systems can far exceed this, with evidence of 70% savings on many sites. The EECA are referring to building design, insulation and smarter energy use, all of which can rapidly result in a reduced energy bill, and this sort of energy streamlining is a highly recommended exercise. Bringing down energy bills is especially important in Whangarei and Northland, where energy prices are higher than in many other parts of New Zealand. Accounting for depreciation and tax benefits also increase the speed of return on investment. Coupled with the process of streamlining commercial energy use, transferring to a solar power system on site to generate can have a huge effect on the price of energy consumption in business. As a return on investment, businesses can expect to see a return in the region of 15% a year on a solar power system, depending on a number of variables, resulting in a significant return over the lifetime of the system, around 25 – 30 years. Of course, in order to produce a convincing business case for installing a solar power system, a far more precise, site specific economic survey is required. As professional solar power installers in Whangarei and Northland, we will be able to quickly assess and design a tailor made design. For a business solar power solution, there is no ‘one size fits all’ answer. The main considerations are space. If there is ample space, preferably north facing, which bathes in direct sunlight, there is opportunity to install a solar power system. Some businesses have been reluctant to invest in the installation costs of commercial solar power systems in the past, but with the cost of components falling dramatically in the last two years with the increase in production, this is now significantly less restrictive. With commercial solar power, the economies of scale also mean that the return on investment can outstrip that of residential solar power systems. There is also an opportunity to negotiate rates with power suppliers for large-scale projects, providing further potentially significant financial benefits. Commercial solar power systems exactly measure the energy produced, allowing exact reporting and monitoring of energy usage, as well as clear data on the performance of the PV system. There are already some notable commercial solar power projects in Whangarei, most notably, the Tarewa Mega Centre, which is currently the largest solar power system in New Zealand. The centre, whilst motivated to install the system through its dedication to being a sustainable business, has seen notable savings, especially with the offsetting of the 325,000+ KwH used in the air-conditioning system alone. Flagship commercial solar power systems at Auckland International Airport and the smaller scale Warkworth Public Library have also seen good returns. In the ten years from 2001 to 2011, energy bills rose by some 87%. There is no guarantee that energy prices will continue along this trend, but the financial rewards for bringing energy production (at least partially) in house are clear to see. The International Energy Agency predicts that 11% of energy will be produced by PV systems by 2030, and the majority of that will be from private enterprises, including both household and business solar power systems. It is important to remember that the economic returns are far greater when the energy produced through a private solar power system is used to off-set the amount of energy used by the business, rather than trying to generate energy to sell back to the supplier. This is because the energy bought back by the provider is usually at wholesale prices. When designing a solar power system for business, it should be designed to reduce the amount of energy bought from the grid, rather than trying to sell it back. Any surplus that can be sold is simply the icing on the cake. Stand Alone or Grid Tied Solar Power Systems for Business in Whangarei & Northland? Stand-alone solar power systems are unlikely to be the best solar power solution for business in Whangarei & Northland for two main reasons. Firstly, stand-alone systems have no back up. If the PV panels do not produce enough energy to cover peak energy consumption, some functions will not operate. For many businesses, understandably, the risk of power shortages is not worth considering. Secondly, energy produced whilst the business is not in operation doesn’t require battery storage, instead, this energy is sold back to the power company. The scale of large commercial solar power systems means that there may be a substantial income potential from selling surplus energy in this way. This is not an option on a stand-alone solar power system. As a result, some 95% of commercial solar power instillations are grid-tied. It should be noted however, that the biggest returns from installing a commercial solar power system in Whangarei & Northland is the reduction in energy costs, not the selling of surplus energy. This is because energy companies do not (often) buy back energy at the same rate as they sell it. In households, (business rates can vary), energy is sold at around $0.25 per KwH, whereas energy produced by PV systems is bought back at a wholesale rate, usually in the region of $0.10 – $0.17. Systems should therefore be designed to offset as much energy consumption as possible, with the surplus re-sale as a potential bonus. Net Billing (where KwH produced are the same as KwH used financially) are now exceedingly rare. There is no ‘one size fits all’ approach when it comes to creating the optimal commercial solar power system. There are examples of large stand-alone projects working exceptionally well for businesses, but it is more likely that a Grid-Tied system will produce the best financial rewards. Where Stand-Alone systems really succeed for commercial ventures is for rural businesses or those where connecting to the power grid incurs significant cost. These designs are always bespoke, ensuring that the power requirements are matched exactly, and a robust energy storage system is in place to allow full operation during periods of reduced energy production. What about Solar Power Batteries? If you use 10% of the capacity of the battery, they may well last for 10-15 years. If you use 50% of the capacity regularly, they will only last for 2-4 years. Cost of replacement is 10’s of thousands of dollars. Cost of maintenance and replacement of solar power batteries are currently the main reason why stand-alone solar power solutions are not often viable. The value of the batteries are often 50-70% of the cost of the initial set up of the system. Unless you have a very large battery capacity, you will have to monitor your solar power system very tightly to ensure that you don’t over-use the supply capacity. Is a Business Suitable for a Commercial Solar Power System? There are two main things to contemplate when looking at installing a commercial solar power system; space and energy usage. The first of these two is relatively straight-forward. Does the business have enough space to install a PV system? The most common place to install a system is on the roof. Installing solar panels on the roof means minimum disruption to operation as well as reducing potential shadowing of the photovoltaic cells. North facing roof space, or flat roves, on which PV panels can be orientated towards the North, are the best place to site PV panels. The number of panels required, and the energy required depends on the second. Energy consumption. If the space available outstrips the estimated energy consumption for the business, the potential financial returns are huge. Established businesses will have ready access to their energy consumption figures, which can be translated into a PV requirement by an energy consultant. However, more specific data is required in order to guarantee a suitable solar power system is designed. The hours of energy consumption is vital to understand. Commercial solar power systems (grid tied) work best when the majority of energy consumption is during daylight hours. 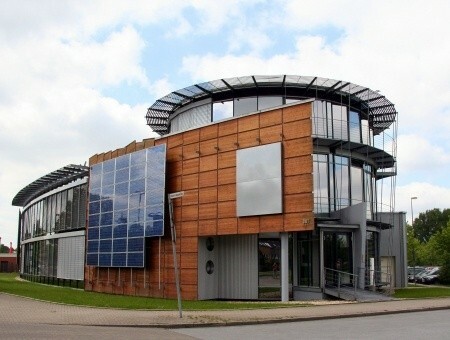 Each project requires its own investigation and calculations to create an economically and environmentally suitable design, but the benefits of bringing energy production in house are clear. We can calculate your return on investment for a business solar power system. Please ask about our calculation sheet. To further discuss the possibilities of a solar power system for your business or commercial property, speak to a our local experts at Potter Electrical, preferably on site.